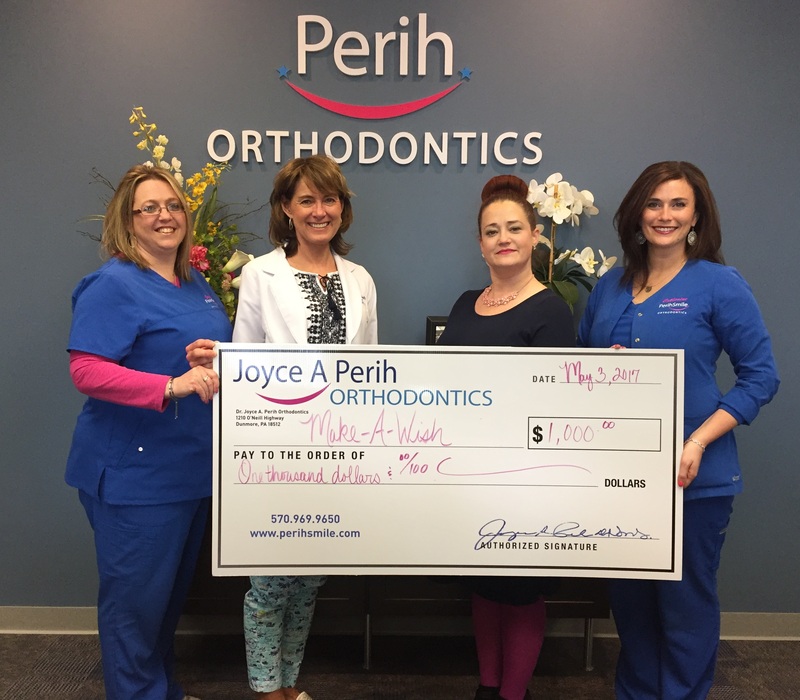 Over several months, Dr. Joyce A. Perih Orthodontics has been holding office contests to encourage their patients to support the Make A Wish Foundation. Matching patients Ortho Dollars, which is a good patient incentive, Dr. Perih and her staff were able to donate $1,000.00 to the Simone Stefanelli Endowment. Drs. James Stefanelli and Joyce A. Perih of Moscow established the fund in memory of their daughter, Simone in 1998. This fund grants wishes to children with life threatening medical conditions to children in Lackawanna, Luzerne, Wyoming, Pike, Monroe and Susquehanna counties. Shown in photo, from left, Scheduling Coordinator Jackie Kizer, Dr. Joyce A. Perih, Make-A-Wish’s Regional Director Maggie O’Brien, and Treatment Coordinator Catherine Klotz. For more information regarding donations to the Simone Stefanelli Endowment or to refer a child in need of a wish, please contact Maggie O’Brien at 570-341-9474.